The Space Exploration Technologies Corp. (SpaceX) Dragon spacecraft was berthed at the International Space Station at 8:03 a.m. CDT Wednesday, a key milestone in a new era of commercial spaceflight. The delivery flight is the first contracted resupply mission by the company under NASA’s Commercial Resupply Services contract. Space station Expedition 33 crew members Aki Hoshide of the Japan Aerospace Exploration Agency and Sunita Williams of NASA used the station’s robotic arm to successfully capture Dragon at 5:56 a.m. The capture came 2 days, 10 hours, 21 minutes and after the mission’s launch. The station was 250 miles above the Pacific Ocean, just west of Baja California. Following its capture, the spacecraft was attached to the Earth-facing port of the Harmony node. The station crew could open the hatch to Dragon as early as Wednesday afternoon to begin unloading its cargo. The capsule is scheduled to spend 18 days attached to the station before returning for a splashdown in the Pacific Ocean off the Southern California coast. Dragon delivered 882 pounds of supplies to the orbiting laboratory, including 260 pounds of crew supplies, 390 pounds of scientific research, 225 pounds of hardware and several pounds of other supplies. Dragon will return a total of 1,673 pounds, including 163 pounds of crew supplies, 866 pounds of scientific research, and 518 pounds of vehicle hardware and other hardware. understanding of how humans can safely work, live and thrive in space for long periods. The ability to return frozen samples is a first for this flight and will be very helpful to the station’s research community. Not since the space shuttle have NASA and its international partners been able to return considerable amounts of research and samples for analysis. The Dragon spacecraft lifted off from Cape Canaveral Air Force Station in Florida at 8:35 p.m. EDT Sunday aboard a SpaceX Falcon 9 rocket. 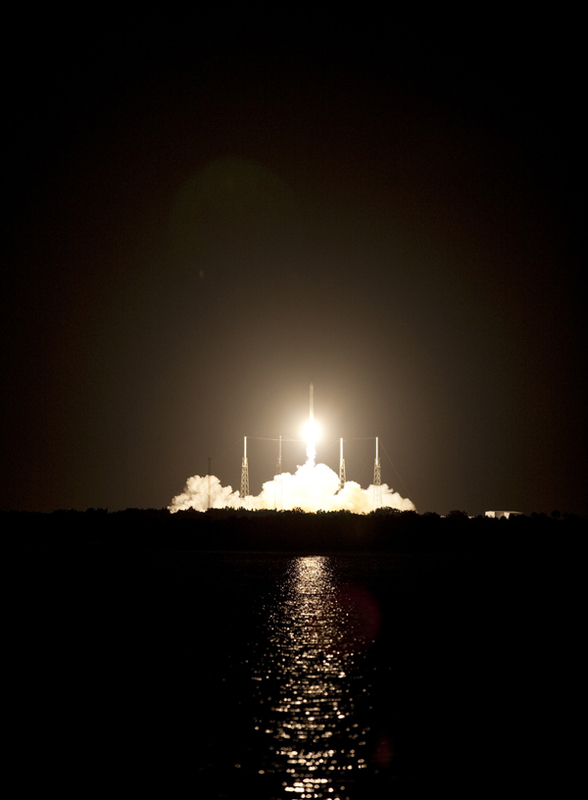 The mission was the first of at least 12 Space X cargo resupply missions to the space station through 2016. The resupply contract with NASA is worth $1.6 billion. “Under President Obama’s leadership, the nation is embarking on an ambitious space program that is bringing critical launches back to the United States, in-sourcing American jobs, and keeping the nation on the cutting edge of technology development and innovation, all the while, maintaining America’s world leadership and dominance in space exploration,” Bolden said. grappled by the station crew and installed on the orbiting laboratory. Orbital Sciences is the other company participating in COTS. Orbital’s Antares launch vehicle is on the launch pad at Wallops Flight Facility in Virginia. The rocket and pad will undergo a series of fueling tests that will take about three weeks. After the tests are completed, a hot fire test of the Antares first-stage engines will be conducted. A flight test of the Antares with a simulated Cygnus spacecraft will be flown in late 2012. A demonstration flight of Cygnus to the space station is planned in early 2013.